About myself: I retired from teaching first grade after thirty six years. I have always loved to sew, and paint. I have been quilting since the seventies, but never finished a quilt until the day before the year 2000. After I retired I had time to sew from morning till night and I did! 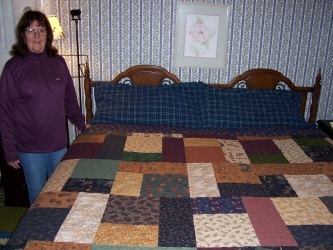 I made thirty quilts the first year of retirement! I recently started hiking the Adirondack Peaks with two friends, at the age of 59. I dream of being a 46er but not sure that will be a reality. 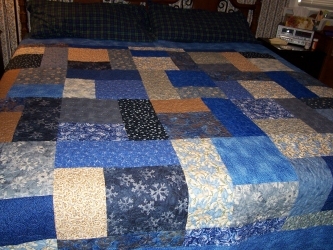 At any rate, the flannel quilt is done with all kinds of moose fat quarters. (I call it Moose on the Loose That is for our leader Elly, who is an accomplished hiker, and has hiked most of the high peaks in NY, VT and NH. She is always cold...so hence the flannel for her! The second quilt, the blue, is for my other hiking partner, who is also a long time childhood friend, we grew up together in a small rural farming community. She is an expert on all kinds of plants and flowers. I had a wonderful collection of snowflakes, flowers and bird fabrics all in blues (her favorite color), that I used in her quilt. I call it Flakes and Flowers...it is kind of an all season quilt...winter flakes...spring flowers...summer birds....you get the idea. The most wonderful thing about this pattern is its simplicity. I have always been an avid collector of fat quarters, with no real purpose for them, just that I like the collections. NOW I have a purpose for all of them...and already have another planned in my mind. I started both of these quilts last week, and put the binding on both of them yesterday. A fast wonderful gift. I am meeting my friends this weekend, and cannot wait to see their faces when I give them!!!! Keep up the great work Tricia!